If you’re into high scoring totals, this is the game for you. Clemson and Kansas have been scorching on the offensive end through two games, and whichever team can stay hot will earn a trip to the Elite Eight. Friday’s match-up will come down to the guard play. Clemson features three 6’3″ guards in Gabe DeVoe, Shelton Mitchell, and Marcquise Reed. Each player can stroke it from beyond the arc, make plays for others, and compete on the defensive end. DeVoe has the hottest hand as it currently stands, shooting over 60-percent from the field through Clemson’s two games. Playing against Kansas means a healthy serving of Devonte’ Graham. The National Player of the Year candidate willed his team through a tough-shooting night against Penn, but will have to bounce back after a 1-for-7 performance versus Seton Hall. Against an experienced Pirates squad, Kansas got huge efforts from their own trio of wings — Svi Mykhailiuk, Malik Newman, and LaGerald Vick. Both teams have suffered injuries that are worth noting. Kansas got Udoka Azubuike back just in time for the tournament, but Bill Self has opted to ease the big man back into the rotation. He’s come off the bench for both games, and has logged 25 total minutes. Clemson lost versatile forward Donte Grantham back in January, and stumbled to the end of the regular season without him. Although he wasn’t needed for Clemson’s two blowouts victories, this could be the game where they feel his absence. All things considered, the Jayhawks still hold a slight edge in this match-up. Clemson has been red-hot from long range (40-percent in postseason), but they’ll eventually return to the mean (36.6-percent in regular season). Kansas has too much offensive firepower for the Tigers to handle. The zone has reigned supreme this postseason, as two of the most popular zone-centric teams found a way to match-up in the Sweet 16. Jim Boeheim and the Orange are the most well-documented zone users among the top schools in the nation. They’ve used it with great results on a number of tournament runs. With so few days in between games, teams struggle to game plan against their scheme. Syracuse is always well-equipped with long, rangy athletes that make it difficult for the small-ball teams to get good looks off. When opponents eventually do find an open shot, the Orange are quick enough to get out and contest. It will always be a struggle offensively, but Syracuse finds ways to stay in games with their gritty style. The Blue Devils have used zones in spots during Coach K’s tenure — most famously during their 2015 National Title run. When Wendell Carter Jr. and Marvin Bagley III were struggling to coexist earlier in the year, Coach K went to zone to utilize his two big men’s elite size. 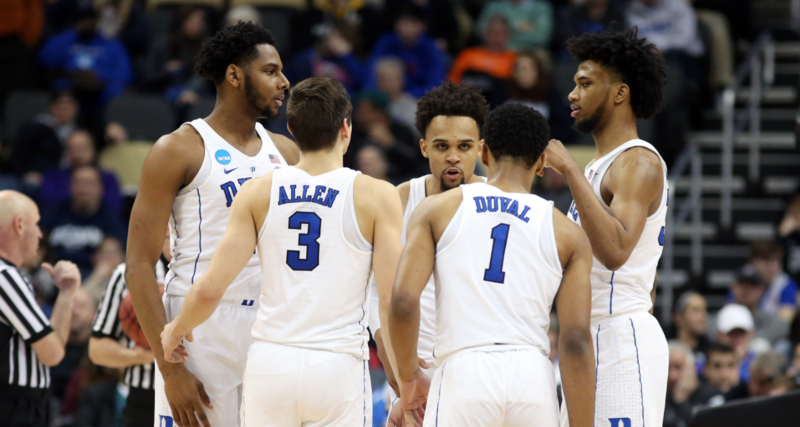 It’s worked to perfection, as Duke went from 124th in Defensive Rating in 2017 to 40th in 2018. Offensively, this team has too many weapons to count. Carter and Bagley get buckets at will near the basket. Grayson Allen and Gary Trent Jr. have hit a combined 15 threes through two games. Trevon Duval is scary in transition, and a solid playmaker off the bounce. Guarding all of these guys is a near impossible task. Duke collectively breathed a sigh of relief when Syracuse bounced Michigan State in the Round of 32. 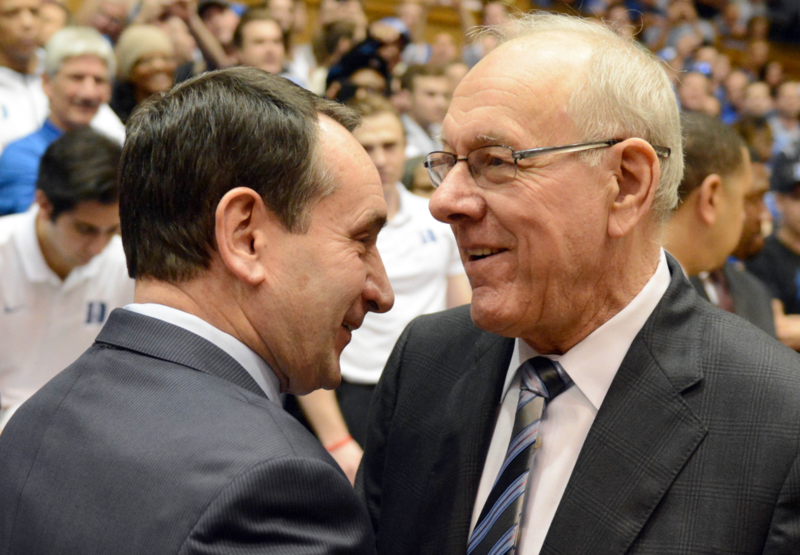 More than any team in the field, Duke is familiar with Syracuse’s style of play. They won’t need to gameplan much heading into this match-up, and have already beaten the Orange earlier in the year with Trent and Duval having abysmal games. Expect much of the same, with Duke’s guards beating the initial defense and dropping it off to their twin towers down low for easy baskets.